What is a dreamflight? How can we tell, when we wake, whether we’ve been on a ship, or just had a “normal” dream? Or if we even dreamed at all? What I do know is, we don’t need to worry about it. We’re all working in ways that some of us cannot perceive. We all bring gifts to this community, to the world, and to dream-time and other planes, that we don’t need to be able to describe and explain. This is where intuition and guidance come in. I hadn’t painted in several months, and sat down with the paper and brushes, nagged by a mild dread that I’d just make a muddy mess and still have to go online and hunt for wings. Then I found the pearlescent watercolors I’d never used. My attitude shifted. Next came the cheap block of watercolor paper. “It doesn’t have to be precious, Leslee. Just sit down and paint.” So I filled the water bucket, grabbed the nastiest brush – the one that sheds everywhere – and started doodling. As I painted, I thought of the Dreamflights, and my intention to paint wings. A fairy-like figure appeared on the paper, soaring above a circle. The circle turned into a planet. And then my thoughts shifted to a Valiant post I’d read in The Bell Tolls. I thought of Vala, casting spells to cleanse the Earth. And the sketch started to represent that work. That was pretty cool. I finished the sketch, and took a snapshot of it. Then I remembered I was to talk with my friend Victoria in less than an hour. I hurried a bit to get the snapshot ready to insert in the post, and when I was almost finished, Victoria called. We chatted, and talked about many things, but eventually got onto the subject of my health. I mentioned my brain cysts. The conversation moved along to other subjects, and then we talked about her Merkaba ship videos. And she told me she was hearing from the Nordics so frequently, and that ships will start landing soon. When she mentioned the Nordics, thinking of Valiant’s associates, I told her about the watercolor sketch, and emailed it to her. 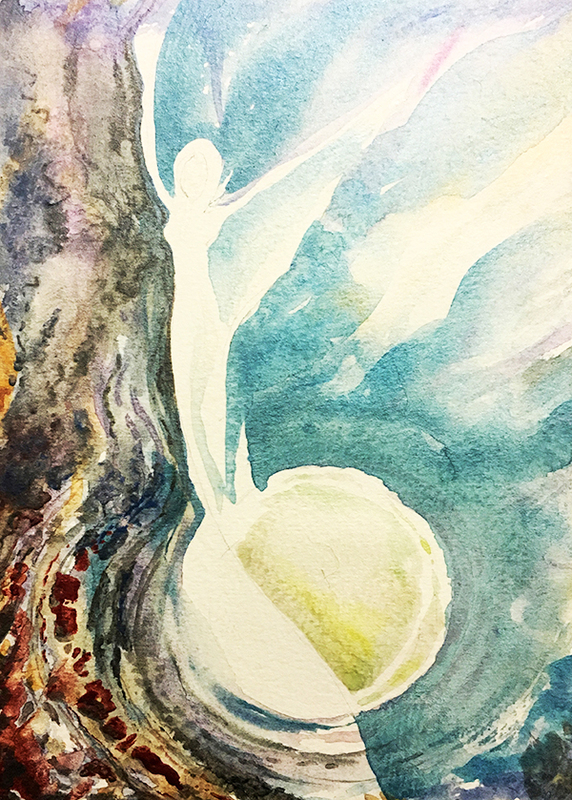 When she saw the sketch, she added that she thinks it’s also about my brain, and healing… and she pointed out the pale profile of the angel swooping down , on the right. I had not noticed it before. And I realized the circle – the “planet” – also looks like my pineal cyst. So… can you see how even when we think we’re doing something simple and straightforward… going to sleep at night, or making a sketch of some wings… there’s no telling what else we’re also accomplishing? Amazing things, the stuff we don’t need to know. Wishing you all blissful journeys, peaceful sleep, and the trust to keep moving into what’s important.